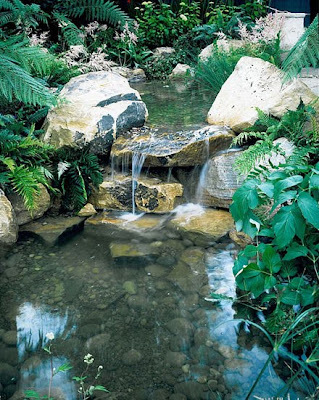 This award winning show garden had an Australian theme and featured tree ferns (dicksonia antarctica), lots of running water and naturalistic rock formations. This view of the same scheme shows the main deck area. 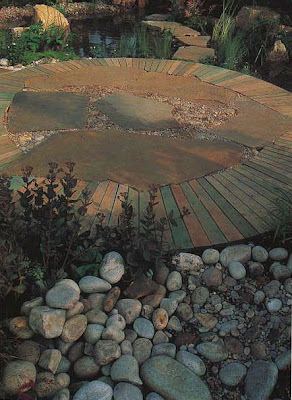 Large slabs of sandstone have been laid within the inner circumference of timber slats. A translucent stain has been applied to the timber to create a distressed appearance while the planting and cobbles in the foreground give this scheme a 'seaside look'. Planting in this scheme included drifts of iris sibirica and lobelia. We have recently been commissioned to design a new landscape around this wonderful high-Pennine farmhouse. The house itself is set in a valley almost at the highest point of the Pennines above Todmorden, and is reached by a narrow farm track. Originally built in the 18th century as a working farm, the field to the front of the house has been extensively planted with trees by the previous owners and has become somewhat crowded. The existing landscape comprises a veritable homestead with two vegetable plots, goats, a chicken run, a river, a quarry and several beautiful woodland glades. The wooded hillside is thick with indigenous wild flowers and runs down to a small, fast flowing river whose series of waterfalls provides plenty of drama and wonderful, magical sounds. The grounds are a natural habitat for birds and wildflowers. There is plenty of scope here for fresh design ideas…the main challenge will be to re-design according to the ‘spirit of the place'. We will have succeeded when the vistas are made more beautiful by working with nature in a sustainable way, rather than attempting to apply any strong principles of garden design in the traditional way. • Hilly terrain means less sunlight especially during non-summer months. There are several existing, fairly flat grassy terraced areas, ideal for use as informal seating areas with two vantage points overlooking the most dramatic sections of the fast flowing river. During the winter months, access to the garden areas becomes difficult, so the panoramas from the house become incredibly important to the clients. • Two points that overlook the river below will benefit from hardstanding that will create areas to sit and enjoy the soothing drama of the water below. So, this project should be both fun and a bit of a challenge. Watch this space for some early design ideas…… see the project developing. This is one of my all time favourite landscapes. It is by the late Cesar Manrique, and is one of his many stunning schemes on Lanzarote. 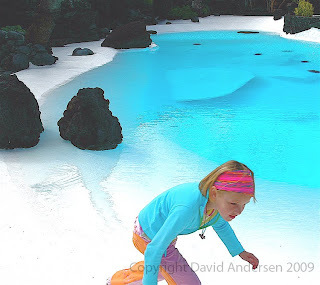 It is a semi-naturalistic water feature/swimming pool, using the natural hollow created by volcanic activity. These clients are lucky enough to have a beach house right by the ocean on Grand Cayman. The house was badly damaged some years ago by hurricane Ivan and is now undergoing a complete refurbishment. We have been asked to design a garden, which will not only reflect the ‘spirit of the place' but also be able to withstand the challenge of gale force winds. In addition to this, any plant material used must be very site appropriate. In this case that means being drought tolerant and resilient to salt laden winds. In these circumstances it is always best to look to nature for direction (a good example of this is the late Derek Jarman's Kent seaside garden, in which he used only minimal, locally sourced plants.) On this site we will also be looking to the natural flora that abounds in the region, for example: Hohenbergia (Hohenbergia caymanensis), Ironwood (Chionanthus caymanensis) and Wild banana orchid (Myrmecophila thomsoniana) . The client brief included a small swimming pool, a decked area for relaxation and gabions (wire crates filled with large pebbles found strewn across the beach). The gabions will be used to define the line between the garden area and the beach in a sympathetic, yet substantial way, and also to create a terraced effect replacing the existing sandy slope. Other design ideas include a funky gateway entrance to the driveway, again using the locally sourced materials, such as weather worn rustic timber, locally quarried stone and even rusty pieces of steel found on the beach.